Monterey Horticultural Oil controls aphids, mites, scales, whiteflies, and other soft-bodied insects on ornamentals, roses, vegetables, citrus, fruit trees, and nut trees. The oil is odorless and non-irritating. The highly refined oil will not burn or brown plants. 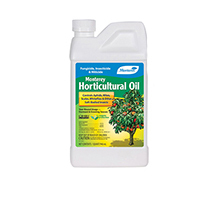 Can be used as a base for foliar applications to improve retention on leaves. Concentrate. Dilute according to instructions. Rinse sprayers and applicators after use.